This is the last post in a seven part series. Miss Part 6? Read it HERE! If I am honest with you, we have had plenty of objections to our big vision over the years. While I disagreed with the article, it did raise some interesting points and objections that I think anyone casting vision should be prepared to address. In this post I will address the top 10 objections I have heard to having and casting a God sized vision for your church. 1. Aren’t you squashing other people’s visions to accomplish your vision? However, I think this statement represents “inside the box” thinking. In The Grave Robber, Mark Batterson describes the idea of a dream within a dream. I believe this concept works perfectly with the idea of a God sized vision! A God sized vision is a vision that is impossible to accomplish alone and even impossible to accomplish without some serious divine intervention. This means that it will require many, many people living out God’s vision for them within the larger vision of the Church to be able to accomplish a God sized vision. I do not believe having a God sized vision squashes God’s vision for church members but rather it creates a climate where living out God’s vision for their lives is essential in order to accomplish the larger vision of the church! Jay Cook is one of my best friends from college. When Jay joined our staff team in 2009 it was his first ever ministry job. We brought him on as our pastor of discipleship. Over time, we realized that Jay had a passion for Christian Counseling. Jay felt led to get a master’s degree in counseling and become a licensed professional counselor. Our vision of planting 30 Point Churches in the Triangle by 2025 did not squash God’s calling on Jay’s life. Rather, we knew that if we were going to be a church planting movement helping thousands of people follow Jesus, then we were going to need a gifted counselor to oversee our premarital, marriage, and professional counseling. 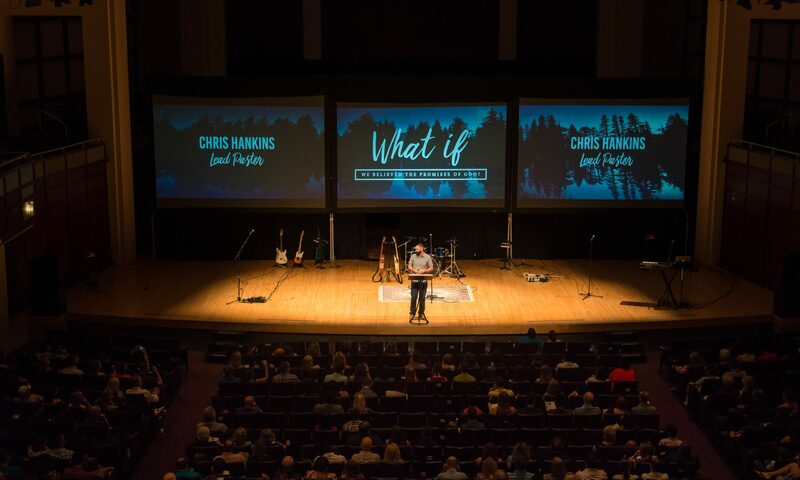 The God sized vision of our church actually provided a unique opportunity for Jay to live out God’s vision for him in an incredible way that would not have been possible at many churches. Jay accomplished his dream of becoming a Licensed Professional Counselor and now serves as The Point Church’s Care Pastor. Jay is living out God’s dream for his life and in turn helping the larger dream of our church become a reality. I could literally write a book of stories of how the God sized vision of our church has given people the opportunity to live out the dream God has for them within the dream God has for our church! 2. Isn’t this more Old Testament than New Testament? All of Paul’s letters to letters to the churches in Revelation were to the church collective rather than individuals. We need to get out of our individualistic mindsets. 3. Can’t God have more than one vision for a church? Yes, of course God can have more than one vision for a church and I think He does. That is why I recommend praying for a God sized vision that is big enough to fulfill multiple smaller visions at the same time. When you have a God sized vision, it does not mean that one vision is the only thing your church will be doing. However, it is a reality that if everything is a focus then nothing is. A big vision helps to bring focus and clarity. 4. What if we don’t reach the vision? While we might not have reached our goal of planting 30 churches, we would have without doubt planted many more churches because of the God sized vision than we would without it. If your church gets to the accomplishment date and does not realize the full vision, then celebrate what God has done through the vision that would not have happened otherwise! Also, if we were to plant 30 churches in the Triangle by 2027 instead of 2025, I am pretty sure that no one would call our church a failure. However, without a God Sized Vision with an accomplishment date, we do not have anything concrete to shoot for — and if you aim at nothing you’ll hit it every time! 5. When you put a date on a vision doesn’t it force the church to take steps they might not ready for? This is probably the second most asked question that we receive about our vision. People regularly ask us, “Would you plant churches that weren’t ready just to accomplish the vision?” I think this is actually a very valid question to ask. I do believe you can be so committed to the vision that you can make unwise choices to achieve it. However, I think we get into trouble when we resort to “either/or” ways of thinking. For example, when The Point Church was four years old we were in one of those situations. We felt like we did not have the resources or the people to plant another church, but we wanted to make progress on our vision. We prayed and tried to think outside the box. How could we plant another church with less people and less resources? It was from this “outside the box” thinking and praying that God gave us the idea to plant our first Spanish Church! We were able to plant the Spanish Church with far less people and resources because the new Spanish Church met at one of our existing facilities and used all of our existing equipment! This year, we are about to plant our 3rd Point Church in Spanish! When we are desperate to accomplish the vision God has given us while still guarding the health of our church, often we see incredible innovation as a result! 6. Isn’t this trying to be too much like a corporation? If Jesus had a mission and a vision then why shouldn’t our churches? I believe having a mission and vision for your church is not being corporate. Rather, I believe it is good leadership. I believe the church should have the best leadership of any organization on the planet! 7. Isn’t vision just another church growth strategy? Shouldn’t we stop focusing on church growth and start focusing on making disciples? I believe the answer is no. Vision is not a church growth strategy. Vision is about determining where God is leading your church and clearly communicating that to everyone who will listen. 8. Does our church really need our own vision? Isn’t the vision of Jesus for the church enough? God had a unique vision for Esther and His people in their unique time in history. Obviously, the events in Esther were part of God’s grand vision for the redemption of the world. God clearly had a unique vision for that generation. I believe the Bible teaches that God has determined that you and everyone in your church were born in this time, live in this place, and are part of your local church for a very specific reason. I believe that God has placed your church in your community at this moment in history to do something both unique and beautiful for His Glory! Wouldn’t it be a shame if we did not take the time to discover what that vision was? This is why I believe every local church should have a unique vision within God’s grand vision for The Church because every local church is uniquely put together for a purpose. 9. How can we be sure this is God’s vision and not just your vision for our church? Great question! Is it possible for a church to share a vision that is not God’s will? Absolutely! How do you determine if a vision is actually God’s will? We determine if a vision is truly God’s will the same way we determine if anything is God’s will. I usually use the following Four-Part Grid to determine if something is God’s will. Bible – Does the vision line up with scripture? Does it go against scripture? If the vision were fulfilled would the mission of Jesus be accomplished? Holy Spirit – I pray and ask God to show me through his Holy Spirit if this vision is from him or not. People – I am not the only person who has the Holy Spirit. What are other mature believers who are in touch with the Holy Spirit sensing from God about this vision? Events – Does this vision seem to line up with the unique time and place where we live? Does God seem to be opening doors or closing them when it comes to this vision? I have found that if God is continuing to close doors maybe the answer is not necessarily “No”, but “Wait.” Many times it is not a red light but a yellow light indicating I need to slow down and be patient. In my experience, seeking God’s will when all four of these line up (Bible, Holy Spirit, People, & Events) is usually a bright green light from God that it is His will and I should step out in faith! 10. Doesn’t a vision put all the weight on the pastor to hear from God? Isn’t this another example of unbiblical top down leadership? Unfortunately, there are pastors in churches who believe that they are “God’s man” and no one can question their leadership. Yes, I would agree that this model of leadership in unbiblical. However, let’s not throw out the baby with the bathwater! First, the biblical model for leadership in the local church is a plurality of elders. In other words the church is led by multiple, godly, mature, and biblically qualified elders. I do not believe that one person should be the one who has a vision that cannot be questioned. The vision of the church should be decided by the elders God has put in place as they seek to collectively hear from the Holy Spirit. My understanding of scripture is that the elders are tasked with leading the church. If the elders of a church seek God, and are unified and confident of God’s leading in regards to the vision of the church, then I would say that the vision is as biblical as you can get! Let me conclude with an important reality. It does not matter how God-led and biblical your church’s vision is, some people will disagree and probably find another church. In the end, a God sized vision will bring incredible unity and clarity of purpose to your church that is impossible otherwise. If you and the leadership of your church are blessed to discover God’s unique vision for your church in this season, I want to encourage you to not give up! Do not be discouraged if some people do not get on board, because not everyone will. Step out in faith as a church and watch God do more than you could ask or imagine! Be sure to subscribe to the blog so you are notified of future content! Feel free to comment with questions, and share this post with anyone who might benefit from understanding the necessity of a God sized vision!